The same quality construction and advanced grooming capabilities you have come to expect from Groom Industries. Hi-impact polypropylene brush head is bolted to custom bracket to eliminate breakage. 18 inch wide head contains flexible nylon bristles structured like a comb. Loosens and lifts surface embedded pet hair from carpets and rugs. Lifts crushed carpet pile from heavy traffic areas. Releases trapped, ground-in dirt between tufting and fibers. Separates flattened carpet pile after wet cleaning. Allows thorough vacuuming of carpets and rugs. Aerates wet carpet to allow quicker drying. Raises ground-in dirt to the surface for effective vacuuming. Restores carpet pile after cleaning. The Grandi Groom’s long nylon tines reach deep into the fibers of any type of artificial grass and pull the blades upright to provide a maximum bloom. Using short strokes over the area, the Grandi Groom quickly works any type of infill material in between the blades. Should be on every carpet cleaning truck! The Grandi Groom is a must for every professional carpet cleaner! Show your professional professional image. Leave your high-end customers’ carpets with a “like new” appearance by grooming the carpet. Most of your competitors won’t bother taking the extra time to do this step, showing that they take no pride in their work. The Grandi-Groom is the MOST Effective Carpet Pile Conditioner for the Professional Carpet Cleaner. This professional carpet groomer prepares rugs and carpets for cleaning. It raises deeply embedded dirt for vacuum pickup. The Grandi Groom works on most types of rugs and is good for finishing and restoring the carpet and rug pile and pattern after cleaning. A grooming rake helps to loosen stubborn soil and keeps the yarns lifted. The use of a grooming rake on cut pile carpet prior to vacuuming will greatly enhance its appearance. To handle crushed pile, vacuum regularly and use the Groomer to restore matted down pile. Carpet Grooming is important in diminishing warranty claims. All carpets, including berber, need to be groomed using a carpet groomer (rake/brush). It is essential not only for appearance sake but also for proper drying after carpet cleaning. The carpet rake will also untangle pile yarns; eliminate the appearance of matting and crushing. Your carpet rake is also essential for the distribution of after-cleaning treatments, such as carpet protectors. Grooming your carpet with the carpet rake will give maximum light reflection to make your carpet look brighter and more pleasing overall. Carpet grooming will extend the life of your carpet. It is a “must” tool for proper carpet maintenance. Grooming is the solution to the common problems of matting and crushing! Grooming is the process to opening and lifting crushed yarn and to simultaneously loosen and lift deeply embedded soil particles from carpets and rugs for efficient extraction and cleaning. The custom non-strapping bracket is made of steel for lifetime use. Finish grooming the cleaned carpeting to render the “like new” appearance. Restructures the original design of carpet. Permits better penetration of chemical solutions when extraction cleaning the carpet. Revives crushed matted pile in high traffic areas. The Grandi Groom’s long nylon tines reach deep into the fibers of any type of artificial grass and pull the blades upright to provide a maximum bloom. Using short strokes over the area, the Grandi Groom quickly works any type of infill material in between the blades. Show your professional professional image. Leave your high-end customers’ carpets with a “like new” appearance by grooming the carpet. Most of your competitors won’t bother taking the extra time to do this step, showing that they take no pride in their work. What is the difference between a “Grandi Brush” or grooming brush and a “Grandi Groom” or grooming rake? 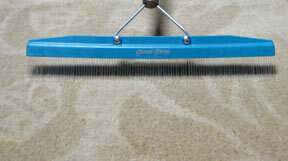 A carpet rake like the Grandi Groom carpet rake has fewer bristles but they are longer and firmer. The Grandi Brush has shorter and more bristles than a Grandi Groom Rake. Use the Grandi Groom carpet rake on anything over a 1/2 inch pile and the Grandi Brush grooming brush for anything under 1/2 inch. The Grandi Groom is best suited for Saxony, shag, and frieze style carpet, while the Grandi-Brush works well for plush carpet like velvet. The Grandi Brush is best for grooming where carpet rakes are too harsh. Appearance: Flexible nylon bristles structured like a brush. Includes a handle. Size: 18 inch wide head. Approved Use: Recommended by carpet manufacturers for maintaining the nap of new carpets. Using a “push-pull” motion will allow the specially designed nylon tines to reach the base of the carpet tufts, separating and freeing the individual fibers of dirt and pet hair that vacuuming cannot get. Using a “push-pull” motion will lift the carpet pile, restructuring the original design. This motion will also give the carpet a finished grooming to render a “like new” appearance. On dense and deep pile carpeting, it is best to finish by a “pulling” motion only. Eliminate tangling of pile yarns. Distribute post-treatment such as protector. Present the cleaned carpet’s best appearance for customer viewing.